Power devices said to cause overheating risk; Apple sees 'no material impact' on finances; battery maker Sony says recent recalls will cost as much as $258 million. 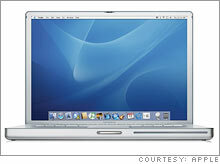 NEW YORK (CNNMoney.com) -- Apple is recalling 1.8 million battery packs for its iBook and PowerBook notebook computers because of an overheating problem, the Consumer Product Safety Commission (CPSC) announced Thursday. Also included in the recall is the PowerBook G4 computer. The recall will have "no material impact" on Apple's finances, according to an Apple spokesman. Apple (up $0.50 to $67.81, Charts) stock was just slightly lower after the recall announcement, but shares of Sony (down $1.16 to $43.26, Charts) fell about 2.5 percent. "It's primarily a Sony issue for Dell, so I expect it to be similar for Apple," said Wendy Abramowitz of Argus Research. "Considering that Apple sells a lot fewer PCs than Dell does, I don't see it having a substantial impact." Apple has received nine reports of batteries overheating, including two reports of minor burns from the computers, the CPSC said. The company said the recall affected 1.1 million notebook batteries in the United States and 700,000 batteries abroad. The computers were sold from October 2003 through this month, according to the CPSC. Apple's is the second-largest computer or electronics recall in history, behind only Dell's (Charts). "We discovered some Sony batteries in PowerPC-based iBooks and PowerBooks didn't meet Apple's standards and performance," said Steve Dowling, a spokesman for Apple. He added that no Intel-based Mac notebooks were affected by the battery issue. Sony said its recent recalls - 1.8 million batteries for Apple and 4.1 million for Dell announced last week - will cost the company between $172 million and $258 million. It anticipates no further recalls of battery packs using these particular battery cells and has introduced additional safeguards into its battery manufacturing process to address the problem. Sony makes about 25 percent of the world's lithium-ion batteries, second only to Sanyo, according to Reuters. Computer makers like Hewlett-Packard (Charts), Toshiba and Fujitsu also use Sony lithium-ion battery packs, but they are different from those used in Apple and Dell models, said Reuters. Consumer safety officials announced last week that they would look for potential fire hazards in laptops of all makers that used the Sony batteries. The company will not take a severe hit from the recall, said an analyst. "Since Apple was proactive in doing this immediately on the heels of the Dell recall, any negative impact on their brand or sales outlook will really be mitigated," said Steve Baker of NPD Group. "The fact is that they've said they're going to replace all 1.8 million batteries and that these batteries aren't in any computers that are being sold today," he added. "The more important issue is how the company takes responsibility for the problem and tries to make things right, and I think they're doing a good job of that." Dell faced increased pressure to recall batteries affected by the problem after photos of a laptop that spontaneously burst into flames were posted across the Internet. Apple consumers with affected products should stop using the recalled batteries immediately and contact Apple for a replacement battery, free of charge. Consumers should remove the batteries from their notebooks and use the AC adapter to power their computers. Apple can be contacted at 1-800-275-2273 between 8 a.m. and 8 p.m. Central Time all week, or customers can log on to its Web site at http://support.apple.com/batteryprogram.